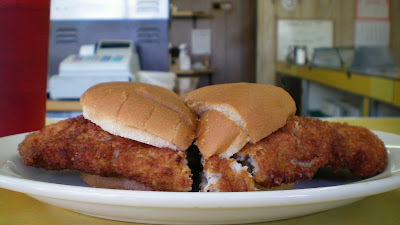 A trip through Jasper County involves navigating past a highway off ramp filled with all the fast-food you can imagine. But a mile past this is a town square with a few independent restaurants that hold out in this economic downtrodden town. 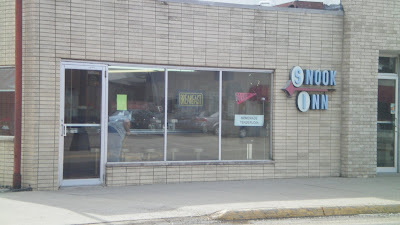 Snook Inn has been in operation since 1939, next door to an old fashioned independent Maid-Rite. It had a sign in the front for "homemade tenderloins", so I decided to stop in. Location: 221 1st Ave. East in Newton, about 40 minutes drive East from Des Moines. Directions: turn north from Interstate off ramp, drive past gas stations and fast food. Turn right on First Ave. and Snook Inn is one block before the town square. 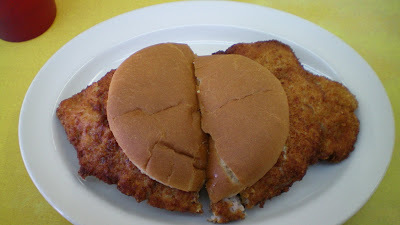 The Tenderloin: The first thing I noticed here was that it was not very tender. This may have been intentional, or perhaps the tenderizer may have taken the day off. There were drips of pork juice on the plate when I lifted up the sandwich. I actually like the amount of pork flavor in this one, and having to chew so much to get it was not a problem for me. The breading was light and did not produce any crumbs at all partly because of the steamy moisture coming out of the white meat. Parts were very thick, with small amounts of fat on the outer edges. Served on a bun with chopped onions and mustard. 7.5/10 . Price: $4.50 Also on the Menu: Burgers, sandwiches, salads and a full breakfast menu. Service: I was here after the lunch rush, only one waitress was working the counter with a cook in the back. Ambiance: The full size windows let natural light into the shop. The walls are wood panelling covered with fliers and posters. Its low-key. Final Thoughts: Newton has become the poster child of the "new economy" in Iowa. The Snook Inn was once a favorite lunch spot for local factory workers. The Maytag plant closings have led to local government begging any business to take their incentives and relocate here. 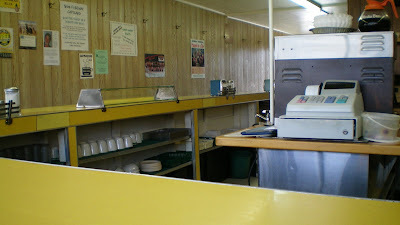 The exodus of working class people and adjustment to more service sector jobs puts these independent lunch counters in a difficult spot. 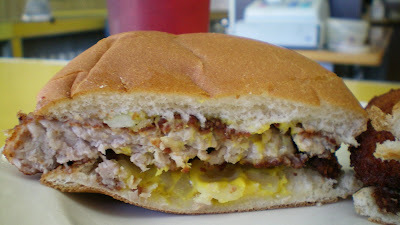 The main road to downtown has as much traffic as ever, but how many people are stopping for this great sandwich. Looking forward to the State Fair! Unfortunately, Snook Inn closed in the summer of 2011. I'd never had their tenderloins growing up or on subsequent visits back home to Newton, but a beefburger (their version of a Maid-Rite) and a couple eggs at breakfast used to tide me over for hours.